Finding a good Beer Cheese Soup recipe has been on my to-do list for a long time. You won’t believe how delicious this recipe is, plus it gets bonus points for being easy to make! Dining in the Midwest means that Beer Cheese Soup is a frequent menu choice, especially when your husband’s family lives in Wisconsin. Plus it’s one of my favorite indulgent soups. I’ve tried making it at home several times over the years without a lot of success – until now. I wanted one that was rich, creamy, silky smooth, and full of flavor. 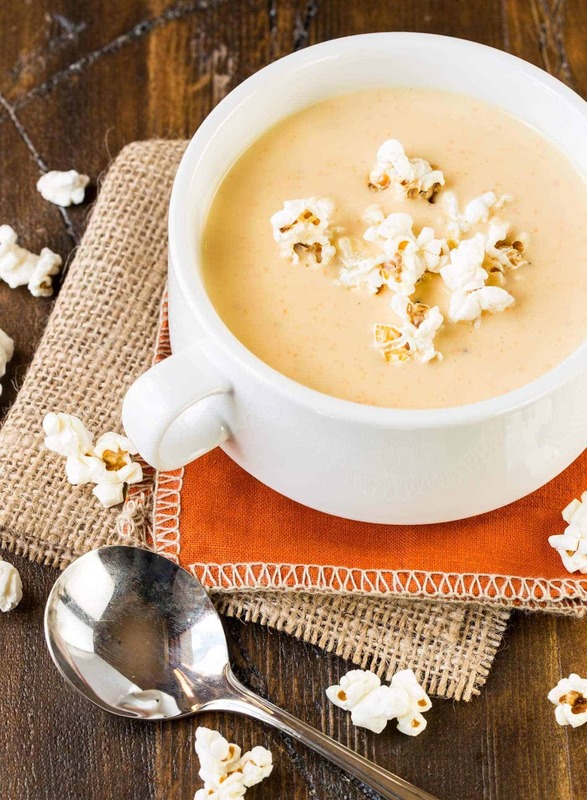 This Beer Cheese Soup is all of that, plus it’s easy to make. Now, my Beer Cheese Soup is a little paler than a lot of others that you see, but don’t let that fool you into thinking that it’s lacking cheese or flavor. This soup is packed with the rich flavor of Kerrygold’s Aged Cheddar. I love the complex flavor it adds. Though it won’t be as orange as one you get in a restaurant, the taste can’t be matched. The key to making this soup easy is an immersion blender. Do you have one? I have this one, and I love it. It is my absolute favorite kitchen gadget, and I use it way more than I thought I would. It’s a perfect way to make this soup smooth and silky, without having to go through the work of transferring the soup to your blender. Which means fewer dishes. And if that’s not reason enough to invest in one, I’m not sure what is. This Beer Cheese Soup makes a great starter course or you can simply serve it with a mixed green salad and call it dinner. But however you serve it, make a double batch. You won’t regret it. Tip: When you are cooking this soup the color will be pale. Don’t panic! It gets darker when you puree the carrots! 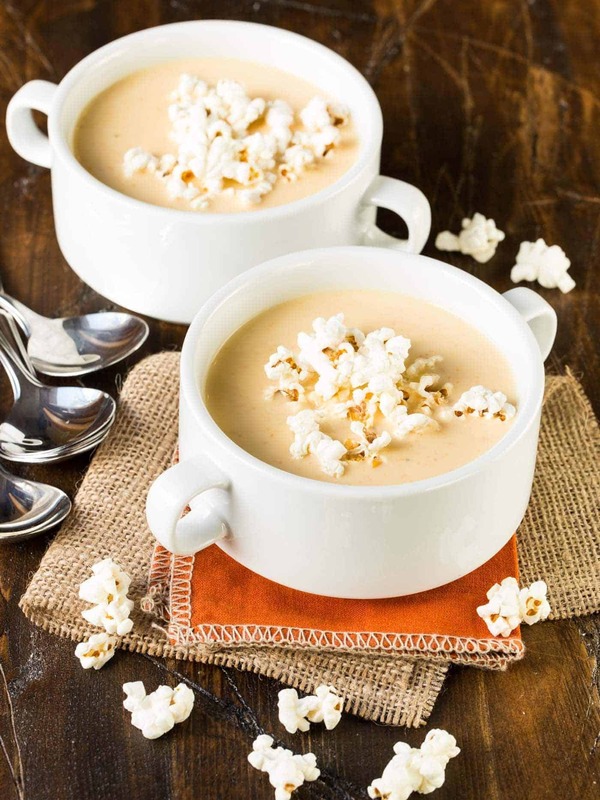 This silky beer cheese soup is a perfect meal on a chilly winter night. In a large dutch oven melt the butter over medium heat. Add the carrots, onions, and garlic and cook until vegetables are soft. Add the flour and cook for 2 more minutes, stirring constantly. Reduce heat to medium low and Add the chicken broth, beer, half and half and milk. Cook for 15 minutes, stirring frequently. Add cheeses by the cup, stirring constantly until cheese melts before adding more. Stir in the Worcestershire, hot sauce and dry mustard. Season to taste with salt and pepper. Use an immersion blender to puree soup until smooth. 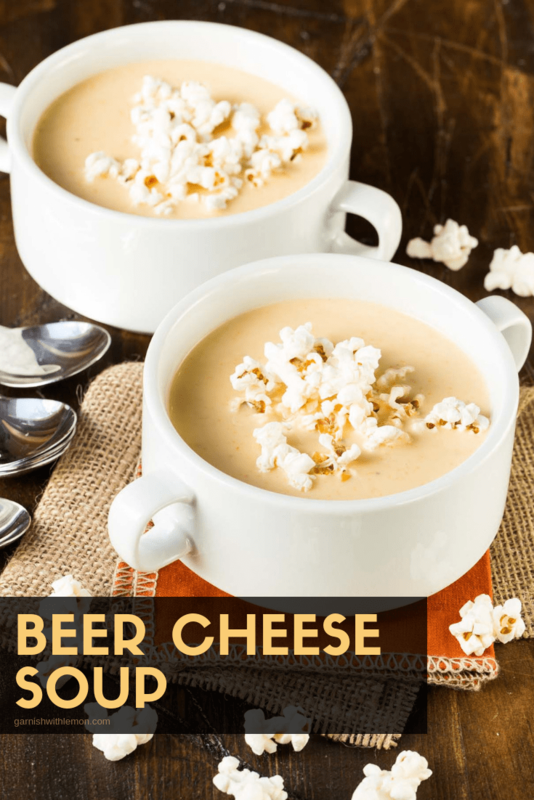 Beer cheese soup is one of my favorites! Topping it with popcorn is brilliant. What! Beer soup? This I have to try. I am intrigued! It’s a keeper! Let us know how you like it! I seriously have to make this for my husband, he is going to love the idea that a beer has been added. This looks so comforting! Love the flavors! Hi Trish, YAY! I’m so glad you enjoyed the soup, it is one of our favorites. Thanks for being a Garnish with Lemon reader! I just made this soup this morning for a Christmas party tonight. Omg it’s so full of flavor. I added 3 tbsp of corn starch & water to thicken it a little more to my liking. Also in true Wisconsin fashion, I added an extra bag of sharp cheddar. This soup should be a hit with my family. Happy holidays! This soup recipe has great flavor. Very rich tasting. I do wish it was a little thicker. Next time I will try adding a little cream cheese to thicken it a bit. I topped mine with big chunky homemade croutons. Delicious!